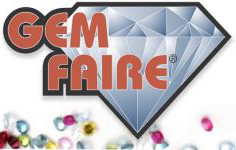 Gem Faire is one of the largest gem, jewelry & bead shows in the United States. Gem Faire vendors like us offer quality merchandise at great prices. Come check out our offerings! You can book rooms at the Mission Valley Sheraton Hotel with a 10% discount (contact the Scottish Rite Event Center Sales Office at 619-293-4895).